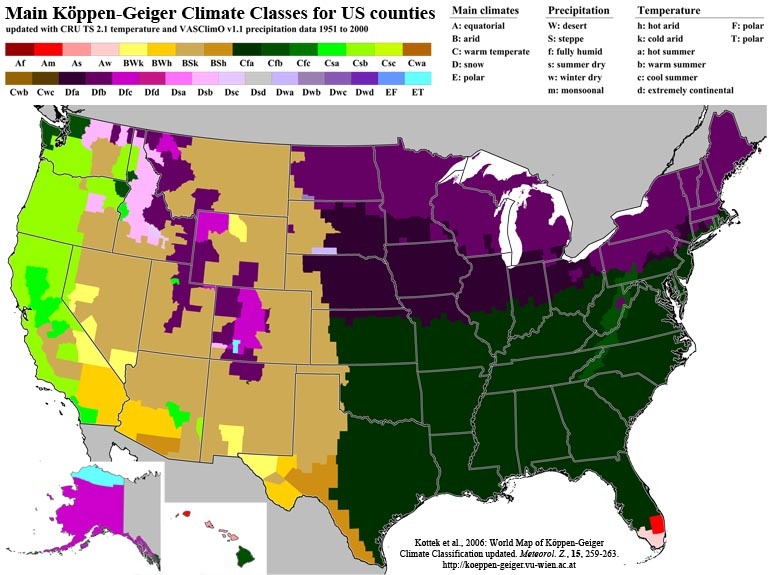 Due to serveral requests we provide also a climate map for the United States of America, an enlargement of the world map, and futher a map with the main climate class for each US county. The latter can also be downloaded as data file. The maps are in Albers equal-area conic projection. 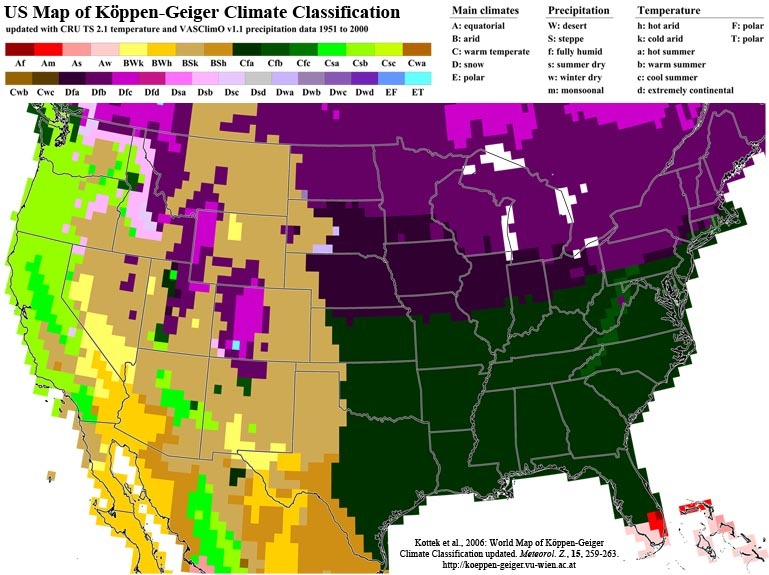 Kottek, M., J. Grieser, C. Beck, B. Rudolf, and F. Rubel, 2006: World Map of the Köppen-Geiger climate classification updated. Meteorol. Z., 15, 259-263. DOI: 10.1127/0941-2948/2006/0130. The file consits of the state name (STATE), county name (COUNTY), the fips code (FIPS), the Köppen-Geiger climate class (CLS), and the proportion in percent (PROP). The re-analyzed Köppen-Geiger map is provided with the higher resolution of 5 arc minutes using the downscaling algorithms described by Rubel et al. (2017). It is representative for the more recent 25-year period 1986-2010. Additionally, the colour table was optimized for the higher resolution resulting in a slightly different look of the map. Download this map as gif-image or as pdf-file. See also the Google Earth maps. The maps and the data file were created by Katharina Brugger, 2017.